Here's what it looked like prefire. 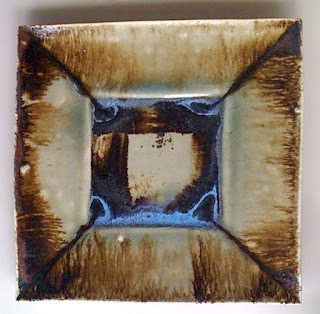 I like the way the edges ran down the corners and pooled in the corners of the small square. I'll remember that the next time I make this form. The mold for this is an el chipo plastic 1960s dish I found at the thrift store. Great place to look for clay forms. The good thing about this is I can lay a slab down on the plastic which I line with damp strips of newsprint, and just let it dry. The recessed center makes a good foot on the dish. What is it with camera lenses? This little "Viking" bowl just doesn't photograph well. Somehow, the camera distorts it. It's body is so much more rounded than it appears in shots. The has more of a smooth transition from flare to the tilted up points. I've tried to take a good photo of this piece several times and so far, this is the best it has shown. I've set it up with a paper drape backdrop, used special full spectrum lights, tried every angle. These shots are done just on my kitchen table with natural light from the adjacent window. Sheesh! The glaze is a shino, fired in oxidation at between a cone 5 and 6. 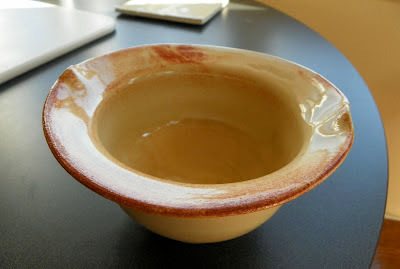 The glaze is from Coyote. 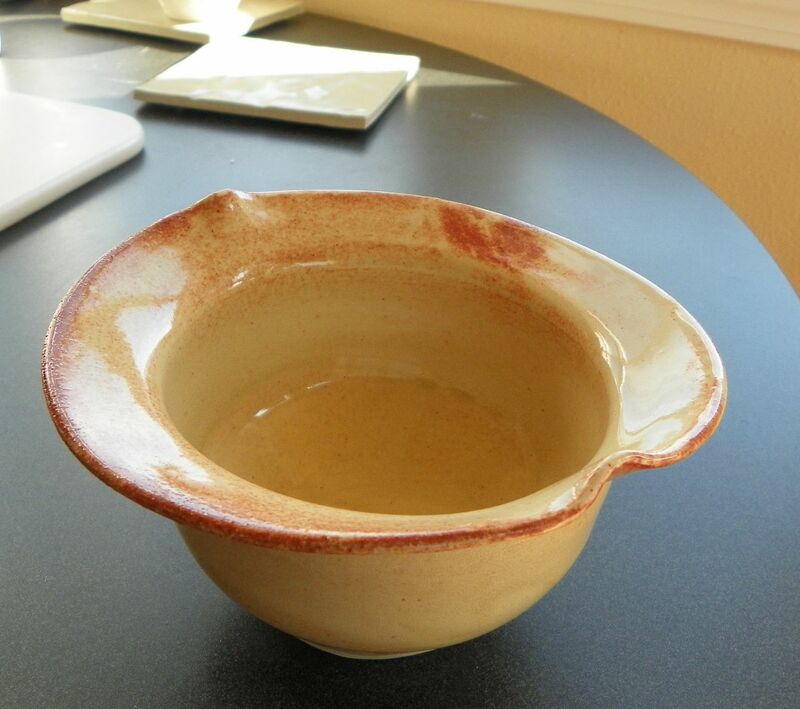 The bowl was thrown on a batt made from a sink off-cut --the piece that has been cut out of a kitchen counter for the sink. Or at least that's how the batts started to be made. I think now, they are just made as batts in the first place. The slick finish on the batt allows me to let the porcelain dry on the batt. If I trim the outer edge of the foot at the time of throwing, I only have to burnish the bottom for a nice, smooth finish. Now that I have a new logo design and business cards set up, I can morph that into any kind of other card. By removing the text under the logo, I can add "Thanks" and add an address, phone number, website address; virtually anything then create a new master for duplication. 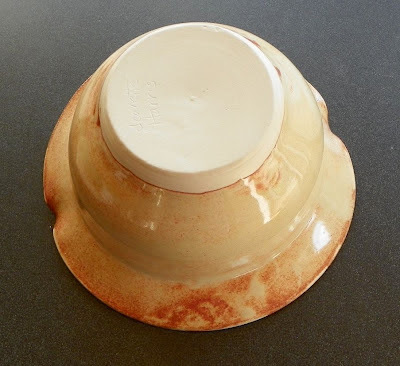 I like to tape a note card to the bottoms of my bakeware that say things "Place in a cool oven" or "Microwave Safe", "Lead-free glaze" or "Microwave Safe - contains iron glaze; may be warm to the touch." And sometimes, "Not suitable for food". I've been trying out some new logo ideas. 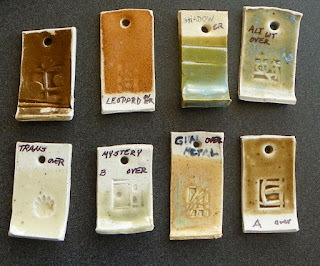 I need tags for my pots for an upcoming show and my old tags need to be refreshed, design-wise. Since I did my last batch, I've changed computers and graphics programs. What a pain! It required some redesigning to get a design resource sheet like this one done. I can take one of these rows and convert it into multiple repeats as a one-design master sheet. This sheet was done to see how new ideas would work out. I started off this series by scanning one of the old hangtags and using that image, manipulated it around for a while trying different designs. When I get something I like, I'll run off a couple of master sheets and put them into a dedicated folder so I can reprint different cards and tags as I need them. On the sheet above, the first and third rows will probably be used for price tags because they will be printed in large batches and they take less ink to make. The darker design will be used for more expensive items or for contact info cards, thank yous, or other special printing. I will take each one of these 4 variations and make a master sheet of each. That will give me 4 different logos to duplicate. For a hangtag, I can run off a sheet and punch holes in the top, put in some black embroidery thread for the tie and attach them to the pots. The design must take into account that a hole will be punched in the top, so room has to be left for that. I want to see how the would look on a pot. There's a lot of difference in how they look on a sheet of paper in a row and how they will look individually. A blaring, dark row will look entirely different as single tags. Likewise, a lighter design might turn out to be wimpy. We'll see. I like to use a creamy heavy paper for my printing. With a strong black and white design, you can print the cards off on any color paper. It gets complicated, but there's lots you can do between a simple graphics program, a scanner and a good printer. Oh, and a big paper-cutter. In every kiln firing, there is usually one piece that comes out better than you dreamed. Some people call them "Racers". This thing has been setting around on a shelf waiting to be fired for a long time. It's big. There hasn't been a firing that allowed a free shelf, so this piece got put off and putt off. But this guy made it into the OVERFIRE kiln. Yikes. All these glazes are supposed to be good up to cone 6. 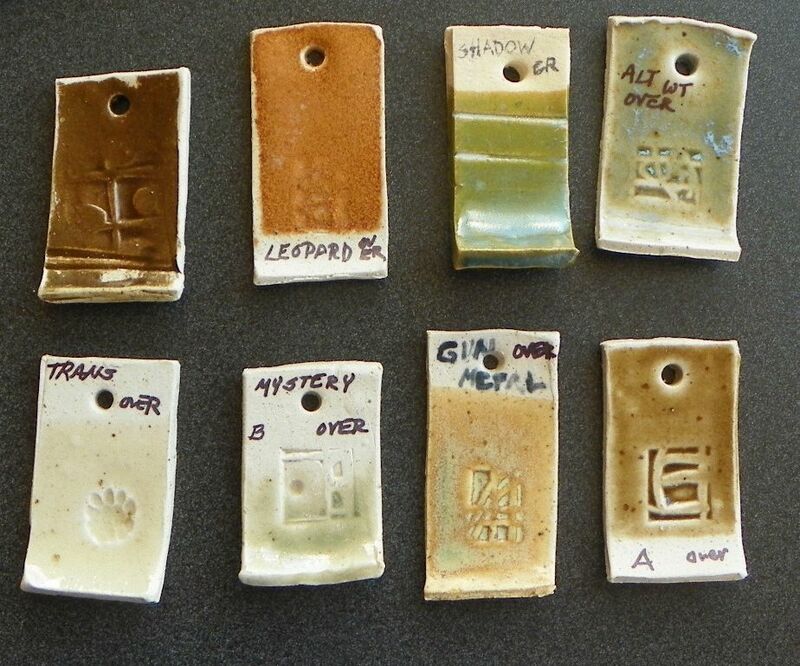 I don't know how hot the last kiln got because the thermocouple malfunctioned. The chances of duplication? almost nil. 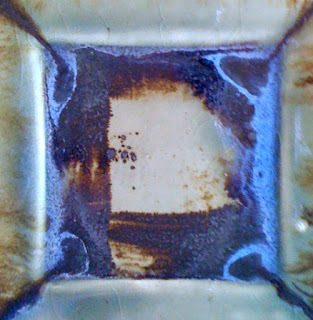 I do know that this is celadon and iron applied over it. It did blister a bit, but no explosions or craters. I just love it. It's a keeper. 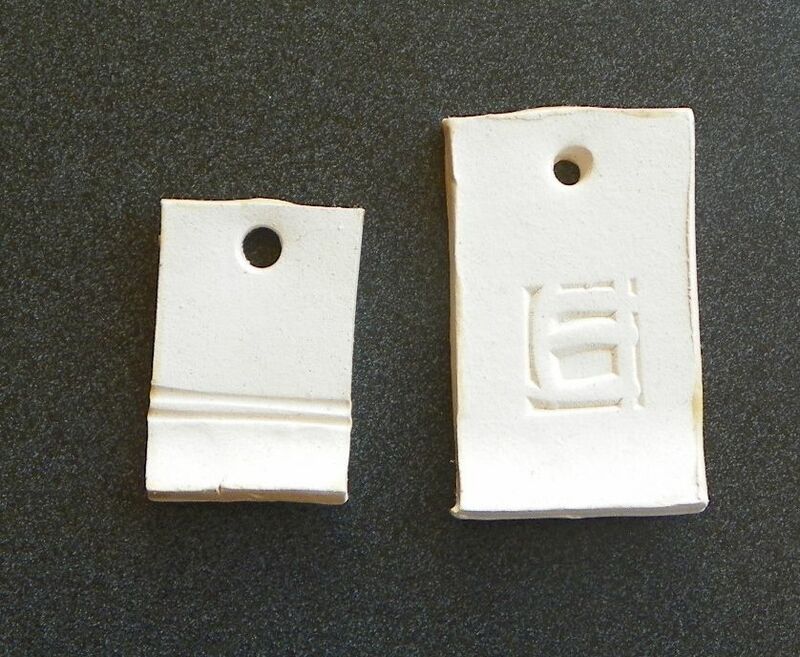 One piece that survived the kiln overfire was a small egg separator. It goes without saying that the inside must be absolutely smooth. My thinking is that this little thing might be handy to have in a kitchen drawer. If you can crack an egg with one hand, you can hold it in the other hand. Or it could sit over a glass, measuring cup, inside a small bowl. I like it so much I think another is in order and maybe this time with a matching cup to go underneath. 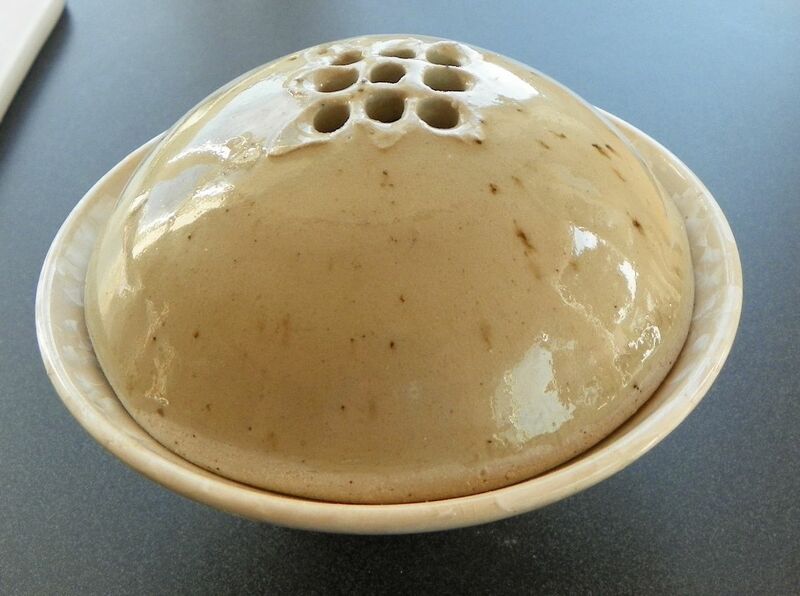 The dome design would work well as a lid for an incense jar or a garlic keeper too. 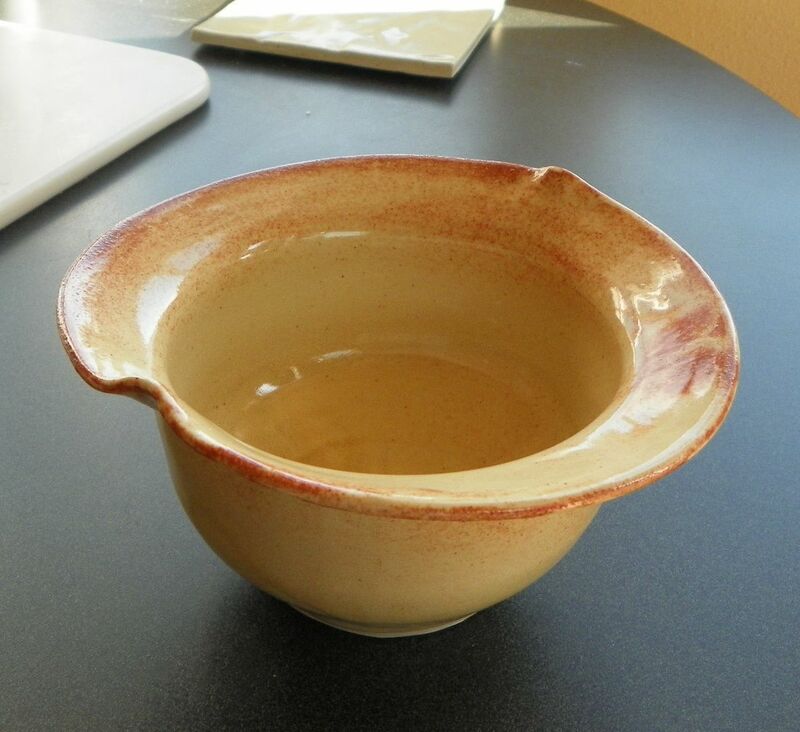 Here it is sitting on a small flared bowl. 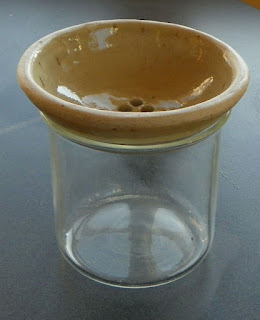 I think lips and flanges are in order for a jar or keeper, though. 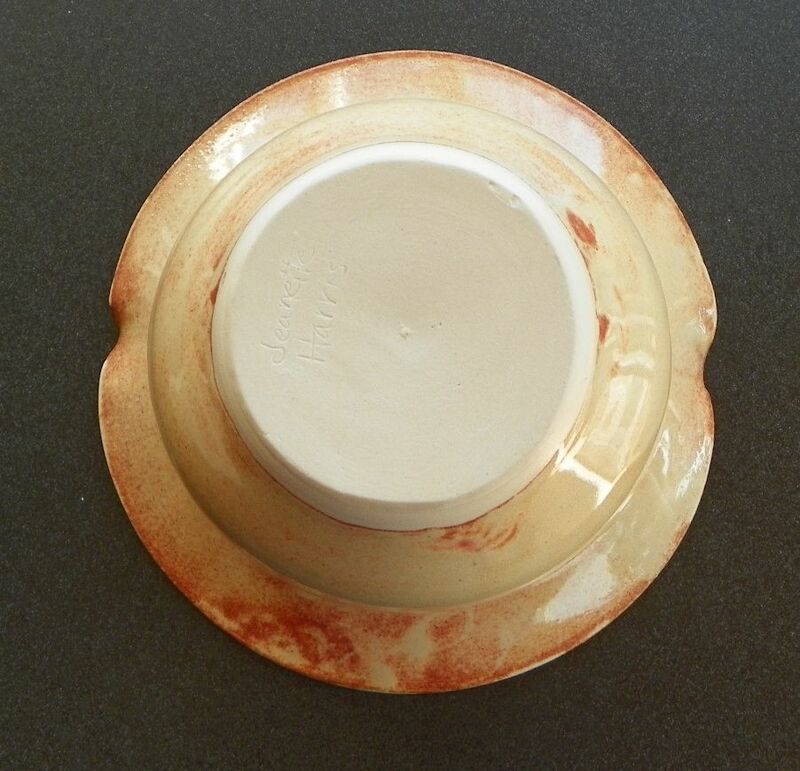 I can see why people find one or two glazes they like and just do everything with those. Testing glazes means a lot of stirring, sieving, dipping, drying, labeling, shifting buckets around, making notations on my test record pages. 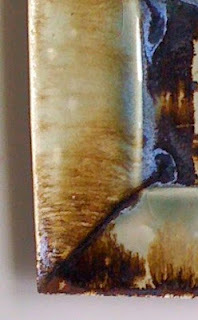 Some tests were about new glazes; some were just checking old ones that might have changed over time. 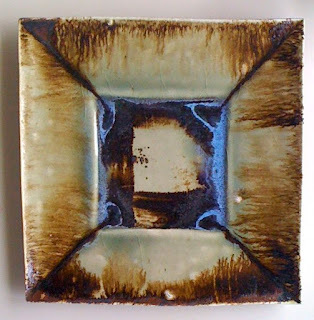 I used to make my tiles really small because I put a string through the hole in the top and tie the tile to the glaze bucket. If the glaze is in a jar, I fasten the tile to the side with a big piece of transparent package tape. I also use a Sharpie to label the bucket or jar in big letters. Saves a lot of time when you're trying to hunt down a glaze. Bigger tiles mean more room for notes. 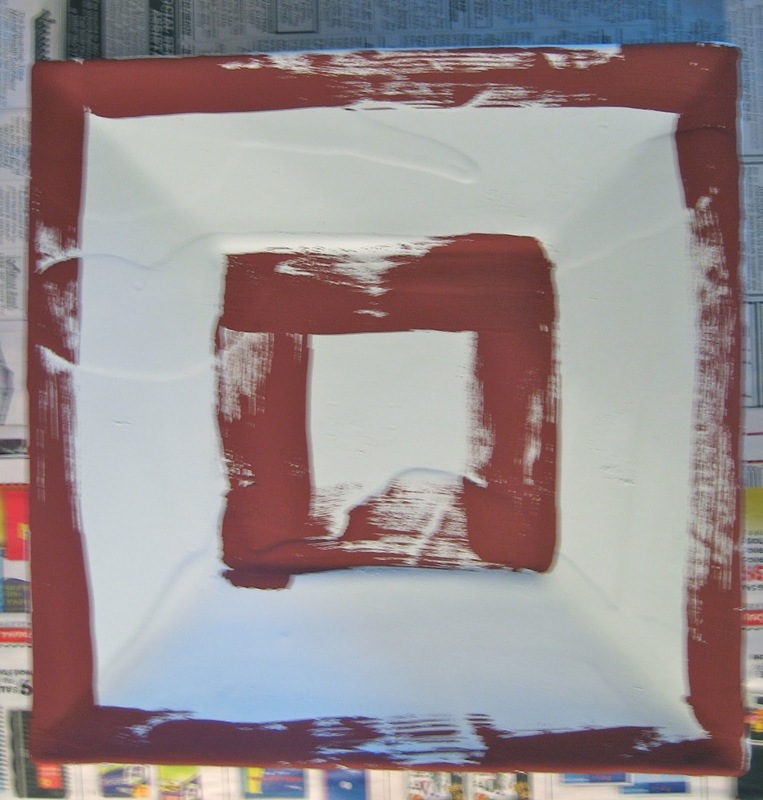 I use any underglaze to do this. Just a dot on a piece of paper or spare yogurt lid is fine and handy for the underglaze. I also like the fine limner brushes to do the lettering with. ----------Of course, just as soon as I wrote this and fired the kiln, the thing overfired. The thermocouple failed. 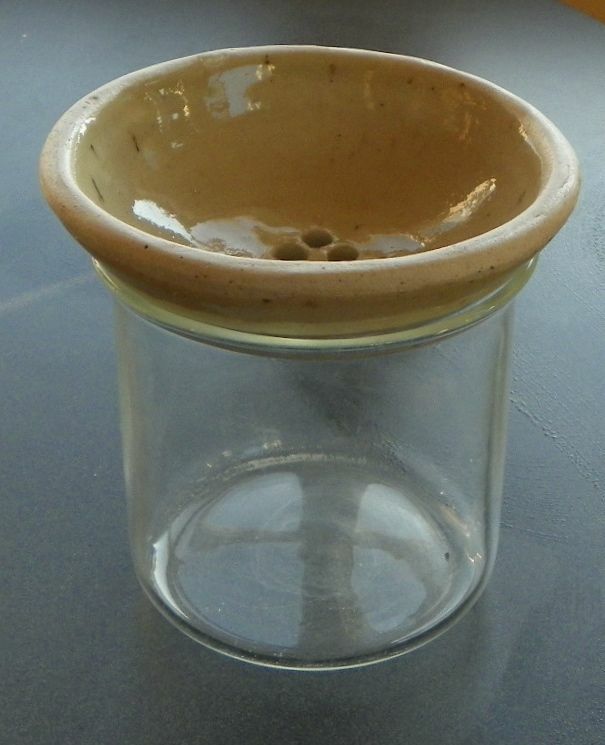 Pots welded themselves to the shelves and the witness cones are beautiful, pearly puddles. 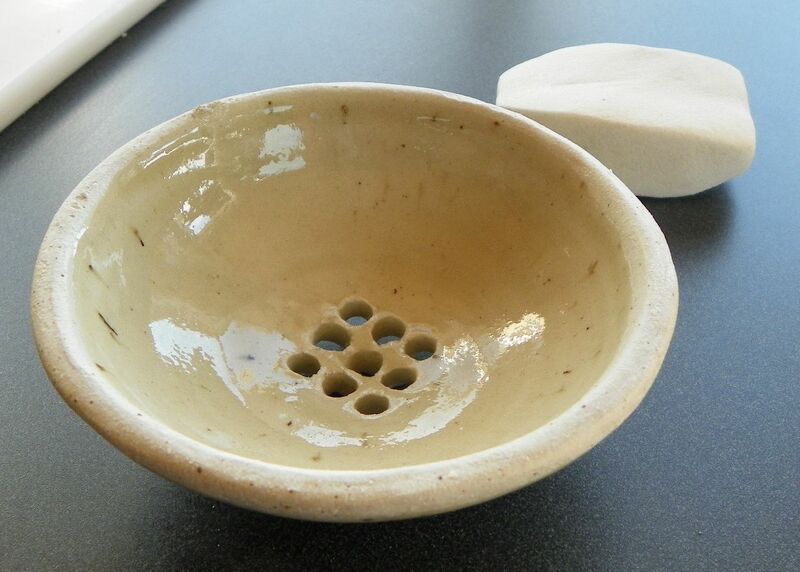 A trip to Clay Art Center is in order. New shelves, new thermocouple, and while I'm at it, some grinding stones. 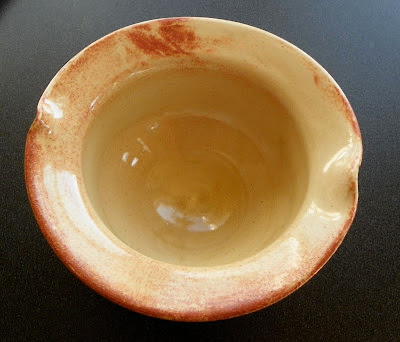 Pottery: It teaches you how to deal with failure and move on. Funny, the things you keep. This urn just blew my mind. 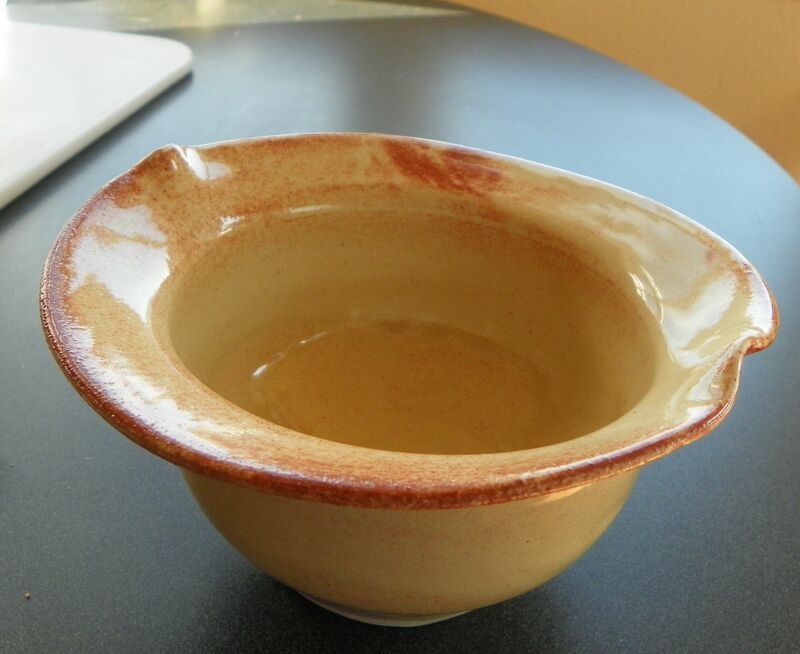 It's made of plastic and has four plates, three bowls, and two small sauce dishes. The whole thing masquerades as a jar. It's so Clever! I'd love to make one like it in clay, but I think it would be too heavy. A modification of this idea might work, though.